Adore sock monkeys much? Our newest magazine quilt, Barrels of Fun, is in the new Spring/Summer 2013 issue of Simple Quilts & Sewing (sold out, but will be available again soon!) and we are so excited about it! This is such a simple, one block design using our good friend the Fat Quarter, and it works great with directional prints as well. 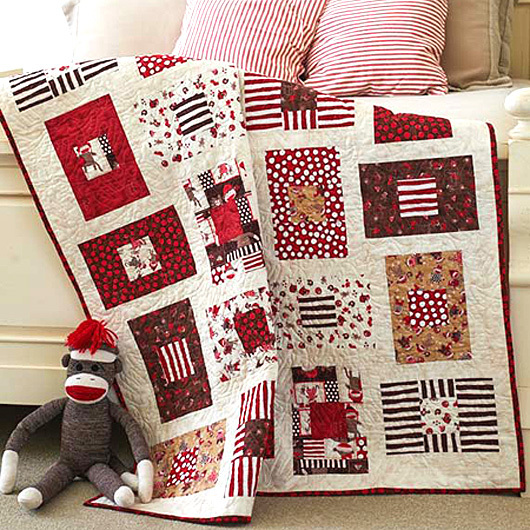 I love the effect of the red and brown stripes in these blocks! Best of all, you can do this in just a few hours. It’s a perfect setting for novelty prints and bright colors, so pick your poison. We do have kits with the Monkey Around collection, so pick up yours today!